The first shipment of powerful magnetic devices for a next-generation laser project arrived at SLAC National Accelerator Laboratory on Wednesday after a nearly 3,000-mile journey from a factory in New York to California in a customized delivery truck. The Department of Energy’s Lawrence Berkeley National Laboratory (Berkeley Lab) is overseeing the development and delivery of these devices, known as soft X-ray undulators. They are a key part of LCLS-II, a free-electron laser being built for SLAC by a partnership of SLAC and four other DOE national laboratories: Berkeley Lab, Fermilab, Jefferson Lab, and Argonne. The two devices that arrived this week to LCLS-II are the first of what will ultimately be a chain of 21 segments making up the complete soft X-ray undulator. They are at the heart of the free-electron laser, as they will cause the high-energy electron beam from a linear accelerator to emit laserlike beams of X-rays. The soft X-ray undulator units present an impressive combination of brute strength and fine precision. Each weighs about 6.5 tons and is about 11 feet long, with sturdy steel frames that are designed to withstand nearly 7 tons of force to keep the two rows of magnets precisely positioned as they try to repel each other. The distance between the rows can be adjusted within millionths of an inch to tune the properties of the X-ray laser light. LCLS-II is a major new facility and upgrade to the existing Linac Coherent Light Source [LCLS], a DOE Office of Science User Facility enabling higher performance, new capabilities, and higher capacity for new experiments. In particular, LCLS-II will provide a continual stream of X-ray pulses that will enable studies at the atomic, molecular, and nano scales, with femtosecond (quadrillionths-of-a-second) time resolution. This knowledge is eagerly sought in fields ranging from biology to materials science. “The delivery is ahead of schedule and below the baseline budget,” said John Corlett, a physicist who is Berkeley Lab’s senior team leader in the LCLS-II project collaboration. Berkeley Lab is also overseeing the final design and mass production of a set of 32 hard X-ray undulator segments, The Lab collaborated with Argonne National Laboratory in the design and development of these segments. (“Hard” refers to higher-energy X-rays, and “soft” refers to lower-energy X-rays.) Undulators using permanent magnets were first used for storage ring light sources and are now in use for free-electron lasers. The late Klaus Halbach of Berkeley Lab was a pioneer in developing the permanent-magnet array used in these devices. Berkeley Lab is also fabricating a unique electron “gun” that kick-starts the rapid-fire electron bunches needed to produce intense electron beams for LCLS-II. 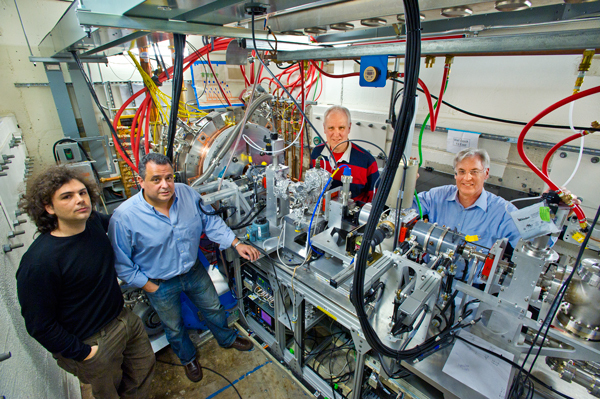 The new gun is derived from the Advanced Photoinjector Experiment (APEX) gun, which was successfully developed at Berkeley Lab and is now being used for ultrafast electron experiments. The APEX electron gun and test beamline at the Advanced Light Source’s Beam Test Facility. As the electron beams go through the undulators, the alternating magnetic fields inside will cause electrons to wiggle, giving off some of their energy in the form of light. As the beam goes through the long chain of undulator segments, each precisely spaced field adds to its intensity. The soft X-ray undulator will be capable of producing up to 1 million soft X-ray pulses per second, and the hard X-ray chain can produce X-ray laser pulses that are up to 10,000 times brighter, on average, than those of the existing LCLS. Berkeley Lab engineer Matthaeus Leitner has key technical and budgetary responsibility for the undulators, while his colleague Steve Virostek plays the same role for the injector system. Other Berkeley Lab contributions to LCLS-II include accelerator physics and technology studies in beam dynamics, free-electron laser design, the low-level radiofrequency system, and the management and integration of cryogenics systems. The soft X-ray undulator shipments will continue every six weeks to SLAC from their assembly at a vendor in Buffalo, N.Y. The shipments will wrap up in spring 2018. To prevent damage and misalignment during their coast-to-coast journey, the undulator segments are being shipped in a climate-controlled truck that includes a special shock-absorbing frame. Now that the soft-X-ray undulator segments are in production, engineers are now conducting magnetic tests on a pre-production version of a hard X-ray undulator segment. These segments will be assembled by vendors in Buffalo, N.Y., and in Los Angeles, and then shipped to Berkeley Lab for tuning before final delivery to SLAC. Work on the LCLS-II undulators is supported by the DOE Office of Science.